QUALITY & LOCATION x3! Osprey 5-bed 5/2 bath custom home with Covered Dock and Boat Lift set in a quiet cul-de-sac. Access Lake Burden for jet and water skiing and fishing. 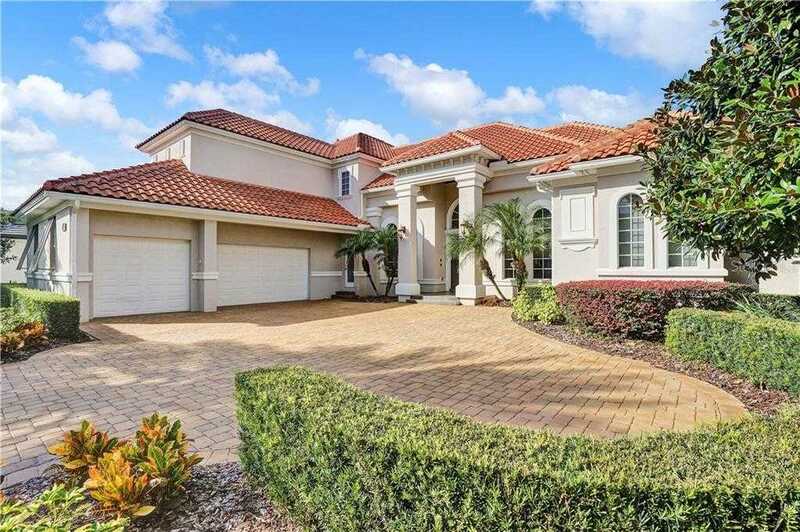 Grand Entrance opens to formal Dining and Living Rooms, all with beautiful 14 8217; ceilings. Elegant quality millwork throughout this home. Office has French doors, wood floors and built-in cherry cabinets. Spacious gourmet Kitchen features Dinette and cherry cabinets, built-in Miele coffee machine, Center Island with Gas Cooktop and 2-drawer refrigerator. Adjacent Family Room has a Study Area/niche and separate Game Room with a 3-zone Miele wine refrigerator. Master Suite and 2 en-suite bedrooms on ground floor. French door Family Room-access to the covered Lanai with plank ceiling and summer kitchen, screened pool & spa area, adding around 1,500sf of entertaining space. Two Bedrooms located on second floor, plus an equipped Theater, Bonus Room/Bedroom 6/Flex Room with Wet Bar and refrigerator plus balcony overlooking the pool. The spacious 3-car garage has an Epoxy-coated floor and is air conditioned. Within Keene 8217;s Pointe, The Golden Bear Club is a Jack Nicklaus Signature-designed golf course, the centerpiece of this awesome community. This private country club has world-class tennis, pool and fitness facilities, being bordered by the Butler Chain of Lakes featuring majestic oaks, towering cypress trees and natural flora. Golf Cart, remaining Window treatments, electronics are included in the sale. See Virtual Tour Link 1 for 360 Tour. Amenities Additional Fees: Access to golf, tennis, fitness center, pool, Country Club facilities and restaurant are restricted to members only and require additional fees. Contact Golden Bear Club membership for more information.